Welcome to Kingsland Health and Fitness Center! As a member of KHFC you have access to the club 6 days a week, all year long. You work out when YOU want to so you can get in, get out and get on with your life! We offer a full line of fitness equipment as well as fitness classes, personal training and tanning. Come join us at Kingsland Health and Fitness Center, and see how it works for YOU! YOU’LL WISH YOU HAD STARTED TODAY! Train like a Beast…Look like a Beauty! The basis of a strength training regimen. Work more muscles in less time…and you can get a full-body workout with just a few dumbbells! The SilverSneakers program is celebrating 25 years as the premier fitness program for boomers and beyond…classes weekly. Tabata training is a high-intensity interval training workout, featuring exercises that last four minutes. Come do a series of movements and exercises that will stabilize and strengthen your core…Golden aXtion on Wednesdays and Fridays at 10:30 am with Andrea & Patty. From Silver Sneakers and Cardio to Schwinn Cycling Bootcamp and POUND, we offer over 30 fitness classes each and every week! 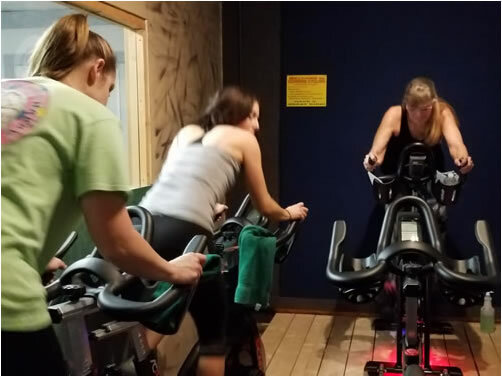 Kingsland Health & Fitness Center is Excited to bring Indoor Cycling with the Best of the Best; Schwinn Cycles! Clean locker rooms for your convenience. Come join us at Kingsland Health and Fitness Center on your way to or from work. Yoga classes four times a week. Check schedule for separate class fee. KHFC members and non-members welcome. One on one personal training to keep you committed and motivated. Must be member of the Kingsland Health & Fitness Center. Come do a series of movements and exercises that will stabilize and strengthen your core…Pilates on Mondays and Fridays at 8 am with Patty. Barre Above delivers a results-driven workout that is not only fun and dynamic, but it will sculpt your body. Dance fitness classes that are fun, energetic, and make you feel amazing. Up to 97yrs! Yes You Can! Yes… lady back right corner, pink top/blue pants … 97! What began in 1992 as a first-of-its-kind class for older adults has grown to a program with classes for different levels and interests so you can find something that’s right for you. SilverSneakers Classic: You’ll move to music through a variety of exercises to increase strength and range of motion. A chair is available for support, and you don’t have to worry about getting down on the floor for exercises. This beginner-friendly class emphasizes building hip stability, shoulder mobility, and core strength. You’ll build endurance and core strength with this Silver Sneakers class. You’ll improve balance through exercises that strengthen the ankles, knees, and hips. A chair is available for support. Classes are designed for older adults. $1465.00…this money will go Far! Kingsland Chamber of Commerce 2016 Business of the Year!